Telcosystems are Gideon Kiers, David Kiers and Lucas van der Velden. They developed their art at the Sonology department of the Royal Conservatoire, and the Interfaculty Image and Sound, a department of the Royal Conservatoire and the Royal Academy of Art in The Hague. In their audiovisual works Telcosystems research the relation between the behavior of programmed numerical logic and the human perception of this behavior; they aim at an integration of human expression and programmed machine behavior. This becomes manifest in the immersive audiovisual installations they make, in films, videos, soundtracks, prints and in live performances. The software they write enables them to compose ever-evolving audiovisual worlds. This amazing hybrid of audiovisual art, print, and the format of a book, comprises 12 sound compositions, each linked to a generated image. Telcosystems produced it in 2015 and it had a great impact on sound freaks, technology fanatics and art lovers alike. 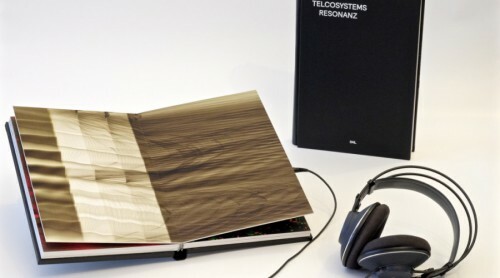 The work is published by Spatial Media Laboratories in a numbered and limited edition of 200.